The No. 9-ranked Penn Volleyball team beat three ranked teams and finished third in the elite Indianapolis Cathedral Lady Irish Tournament on Saturday, Sept. 25. “What an amazing day,” Penn coach Sarah Hendricks said. “All teams at the Cathedral Tournament were (ranked). “The seniors really stepped up and led this team today,” Hendricks stated. “Maddy Wiseman and Jenn Heritz played some great volleyball and their teammates followed. Penn beat No. 11 Columbus East 25-22, 22-25, 25-10 and No. 10 Center Grove 25-17, 26-24. The Kingsmen were defeated by No. 6 Avon, 25-12, 25-8. Penn downed No. 8 New Castle, 25-16, 25-20, in crossover play. Naomi Willis ignited the Kingsmen offense with 78 assists in the Lady Irish Tournament. Maria Schwindman had 25 kills and 16 digs. Italia Fields had 20 kills. Maddy Wiseman also made an impact at the net with 15 kills. Jenn Heritz soared for 14 kills and 7 blocks. 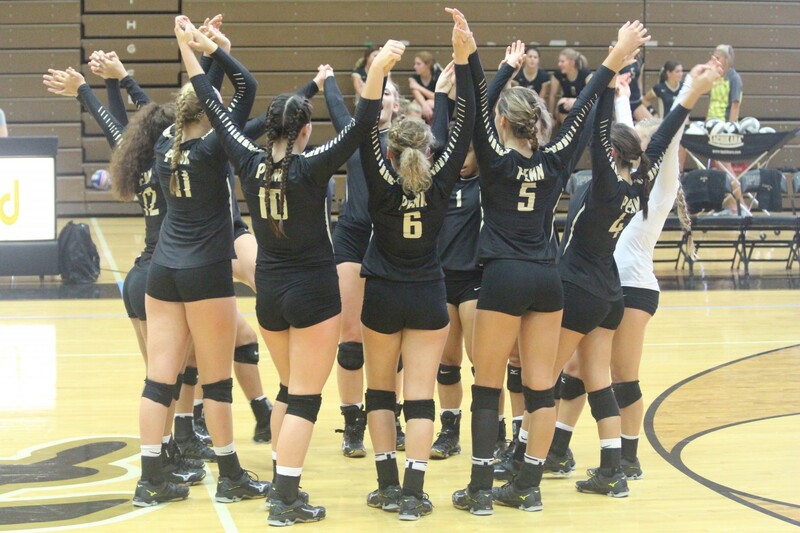 Penn will host Adams on Tuesday, Sept. 27, at 7 p.m.